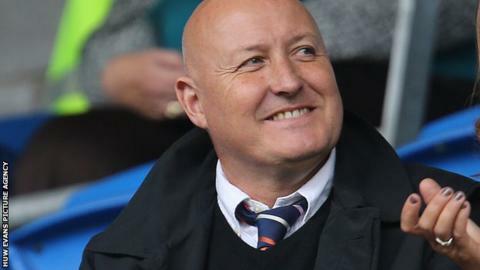 New Cardiff City manager Russell Slade will face a battle to win over some of the players at the club according to former Wales striker Iwan Roberts. The ex-Leyton Orient boss was appointed on Monday after a protracted legal dispute between both clubs. Slade, 53, has never managed above League One and Roberts thinks this may cause problems. "I just think some of the players there will think they are better than Russell Slade," said Roberts. "They [think they] probably deserve someone with more of a reputation and better CV than Russell. "He's never been given the opportunity. It doesn't mean he can't manage at this level." Cardiff had been without a manager since former Manchester United striker Ole Gunnar Solskjaer stepped down on 18 September. Scott Young and Danny Gabbidon had been in caretaker charge since Solskjaer's departure and were at the helm for Friday's 1-0 defeat at Blackpool. Slade tendered his resignation as manager of League One side Orient on 24 September but legal discussions between the Bluebirds and his former club had delayed the appointment. The former Notts County, Yeovil and Brighton manager had been working in a consultancy role with the club but will finally take official charge of a side currently 15th in the Championship. His first match as Cardiff manager will be at home to second placed Nottingham Forest on Saturday, 18 October. Darren Purse made 111 Championship appearances for Cardiff between 2005 and 2009. He told BBC Radio Wales Sport that Slade's lack of experience at that level means he needs to earn the players' respect early on. "The first couple of weeks will be vital for Russell to stamp his authority down within the dressing room," said the former Bluebirds' captain. "If he doesn't do that then there will be a few players that will try their luck with him and try and get away with a few things. "I think if you go in there and you've got a decent CV, you've already got that respect from what you've done in the past. "Russell hasn't got that so he's got to nail that authority down as soon as he walks in the dressing room really."